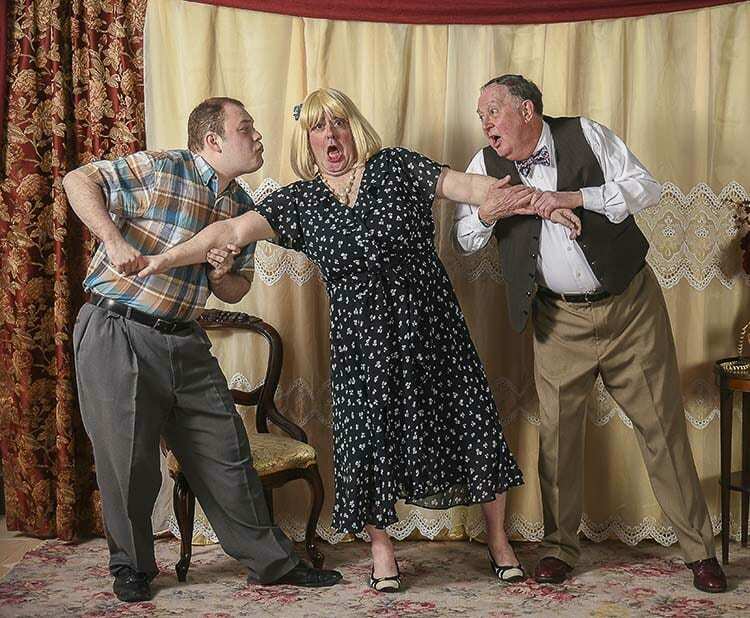 WOODLAND — Area theater enthusiasts are invited to come and laugh with the cast and staff at Woodland’s Love Street Playhouse as they continue their 12th Season with the comedy Leading Ladies, by Ken Ludwig, playing April 26-May 12. The Love Street Playhouse is located at 126 Loves Avenue, Woodland. Single tickets are $20 and are on sale now by visiting the website at www.lovestreetplayhouse.com. Following a dismal performance at the Moose Lodge in Shrewsbury, Pennsylvania, down-and-out Shakespearean actors Leo Clark (played by Kevin Taylor of Longview) and Jack Gable (played by Craig Hoehne of Longview) devise a hair brained get-rich-quick scheme. After seeing a newspaper article about an ailing local woman, Florence Snider (played by Lexy Dillon of Boring, Ore.), desperate to find her long-lost sister’s children, Max and Steve, who moved away to England as children, the men are eager to be cut in on the woman’s $3 million estate. Leo and Jack lay the framework for a plan — only to discover that the old woman is not looking for nephews, but nieces Maxine and Stephanie. The hilarity in playwright Ken Ludwig’s comedy begins when — undeterred — Leo and Jack quickly alter their plan and appear as the newly found nieces. The con gets even more complicated when Leo falls for Florence’s niece, Meg (played by Tracy Sacdalan of Portland), who is the rightful heir to the estate. The fact that Meg is engaged to the local minister adds to the mayhem. 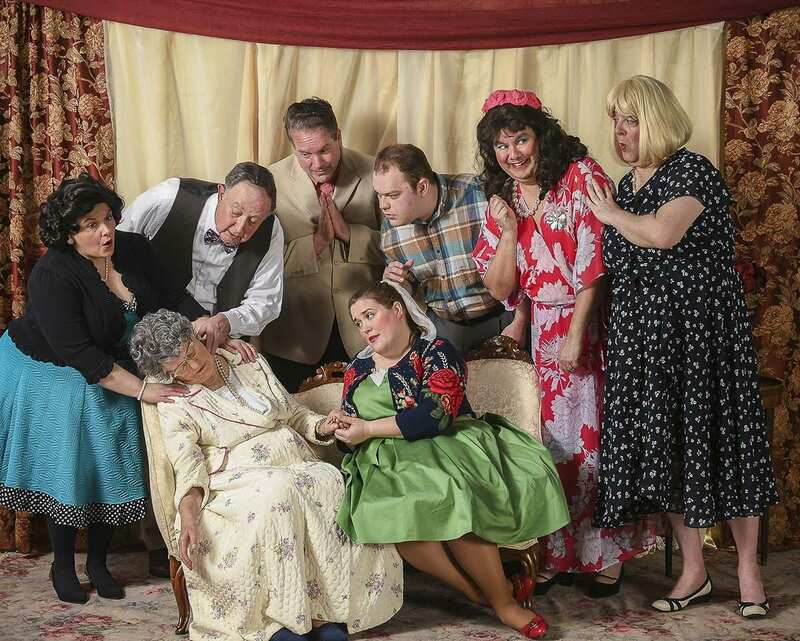 Director and owner of Love Street Playhouse, Melinda Pallotta has assembled a cast of seasoned veterans and newcomers for this production. Kevin Taylor (Longview) plays Leo Clark and Craig Hoehne (Longview) plays Jack Gable. The cast is rounded out with Tracy Sacdalan (Portland) as Meg; Dave Cavallaro (Woodland) as the fussy minister she’s engaged to marry; Katie Klaus (Ridgefield) as Audrey, a roller-skating waitress; Henry Lorch (Vancouver) as Audrey’s not-so-bright boyfriend, Butch; Tom Golik (Woodland) as gregarious Doc; and Lexy Dillon (Boring, OR) as the elderly Aunt Florence. The creative team includes Love Street owner and Artistic Director Melinda Pallotta (director and producer), Lorraine Little (costume design), Managing Director Lou Pallotta (set design and construction), Mikail Nordquist of Longview (lighting design), Evelyn Roehn (production stage manager), Debbie Chunn (choreography) and David Bareford (violence design). Single tickets to Leading Ladies start at $20 and are on sale now to the general public. Tickets can be purchased online at www.LoveStreetPlayhouse.com or by phone at (800) 966-8865. Performances run April 26 through May 12. Performance times are: Fri., April 26 at 7:30 p.m.; Sat., April 27 at 7:30 p.m.; Sun., April 28 at 2 p.m.; Thu., May 2 at 7:30 p.m.; Fri., May 3 at 7:30 p.m.; Sat., May 4 at 2 p.m.; Sun., May 5 at 2 p.m.; Thu., May 9 at 7:30 p.m.; Fri., May 10 at 7:30 p.m., Sat., May 11 at 2 p.m. and Sun., May 12 at 2 p.m.
Local business sponsors and advertisers contributing to Love Street Playhouse include the Port of Woodland, Columbia Bank, Holland America Flowers, Benno and Klazina Dobbe of Woodland, Woodland Truck Line, Conkle Properties, LLC of Lake Oswego, Lou Pallotta of Chianti Club Productions, Columbia River Carbonates in Woodland, Maple Ridge BnB operated by Tim and Lee Welch of Woodland, Lelooska Foundation, Erica Rodman of Woodland Real Estate, Sproos Tap House of Woodland, Woodland Care Center, State Farm Insurance of Woodland, Hooked on Embroidery of Woodland, Last Frontier Casino in La Center, USA Rocks and Woodland Funeral Home.